THIS IS NOT a CHEAP, LATE-NIGHT INFO-MERCIAL HOSE! Look elsewhere for that kind of hose. BUT…if you want quality, you’ve found it! TRIPLE-LAYER NATURAL LATEX INNER TUBE is the strongest material on the market for up to 1200 uses compared to the typical life of only 250 uses! Plus, the 2016 Gardenirvana EXTRA STRENGTH ELASTIC OUTER FABRIC provides superior protection from thorns, pets, and sharp corners. ¾” SOLID BRASS Connectors with shutoff valve prevent broken or stripped-out connections. NO MORE TANGLES, KINKS, or TWISTS! Tired of bending out the kinks in your hose every time you use it? The Gardenirvana Expandable hose eliminates the frustration of kinks and tangles. Expands when you need it…Shrinks when you don’t! DOESN’T KINK. A PLEASURE TO CARRY! Stop lugging around a 30 pound rubber rat’s nest! This garden hose is incredibly lightweight, and it takes up almost NO storage space. 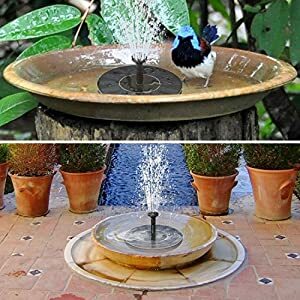 It expands up to 3 times when water flows in (with pressure at least 4.5 bars) and shrinks in the absence of water! Are you sick of having a rubber rat’s nest of a hose taking up space in your garage or backyard? 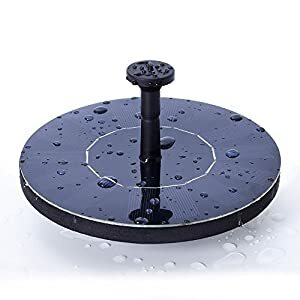 Not to mention having to carry it around the house when watering the Garden or washing the car? What about kinking! Believe never having to adjust or bend out another kink in a hose again. EVER! Expandable hose technology has come a long way…and still getting better. At Gardenirvana, we are on the forefront with our recent expandable hose SUPER BUNDLE! Where many expanding hoses break or only last a week, we’ve designed ours the use of cutting edge technology with the utmost level of quality in mind. 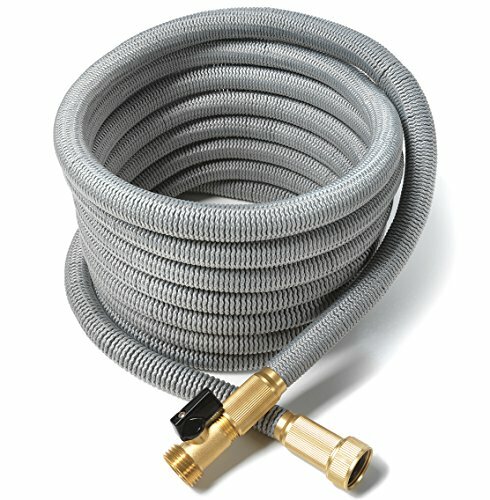 The Gardenirvana Expandable Hose SUPER Bundle is superior for the following reasons: * Expands up to 3 times it’s original length * Made to the highest standards in quality, safety and reliability * Durable Triple Layer Latex hose to prevent bursting * Contracts when the water is turned off making it easy to carry and store * Never kinks or tangles. 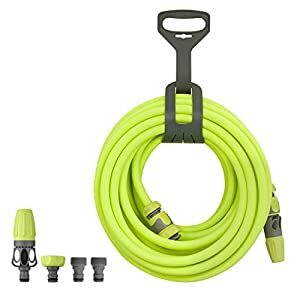 The Gardenirvana 50ft SUPER BUNDLE Includes: *1 x 50FT Water Hose with Brass Connectors and Shutoff Valve *1 x 2-way Metal Splitter *1 x 7 Setting Spray Nozzle *1 x Hose Hanger *1 x Canvas Carry and Storage Bag *3 x Extra Sealing Rings* *We would like RAVING fans, and with our Risk-Free 100% *Satisfaction guarantee, you’ll feel confident in BUYING NOW. THIS IS NOT a CHEAP, LATE-NIGHT INFO-MERCIAL HOSE! Look elsewhere for that kind of hose. BUT…if you wish to have quality, you’ve found it! TRIPLE-LAYER NATURAL LATEX INNER TUBE is the strongest material available on the market for up to 1200 uses compared to the typical life of only 250 uses! Plus, the 2016 Gardenirvana EXTRA STRENGTH ELASTIC OUTER FABRIC provides superior protection from thorns, pets, and sharp corners. ¾” SOLID BRASS Connectors with shutoff valve prevent broken or stripped-out connections. NO MORE TANGLES, KINKS, or TWISTS! Tired of bending out the kinks in your hose every time you use it? The Gardenirvana Expandable hose eliminates the frustration of kinks and tangles. Expands when you wish to have it…Shrinks when you do not! DOESN’T KINK. 100% SATISFACTION GUARANTEED! You risk absolutely nothing! 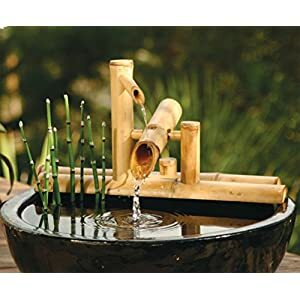 Gardenirvana’s unconditional 100% 12 month money back guarantee means you never worry about making a bad purchase decision. BUY NOW with confidence!